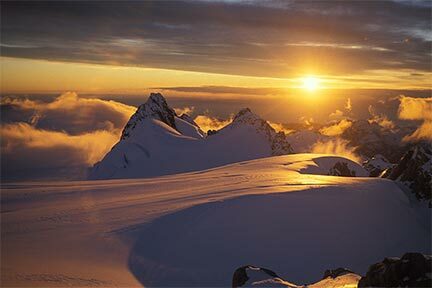 Explore New Zealand's stunning alpine terrain! 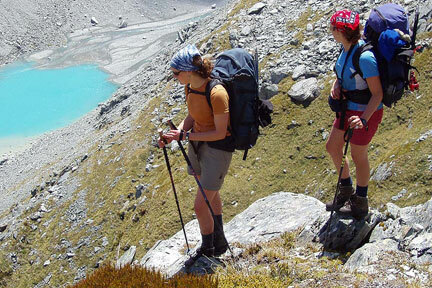 New Zealand is an outdoor adventure paradise with many great walks and tracks to choose from. 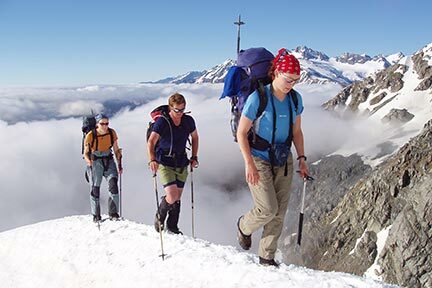 With two clean, heated and well-stocked private huts in the Aoraki Mount Cook National Park and Te Kahui Kaupeka Conservation Park, Alpine Recreation gives you the opportunity to experience these spectacular alpine areas on foot. Our enthusiastic mountain guides and small groups allow you to venture off the beaten track to places you haven't been before. Our equipment is provided FREE of charge to ensure you have the right kit and to take the hassle out of travelling. 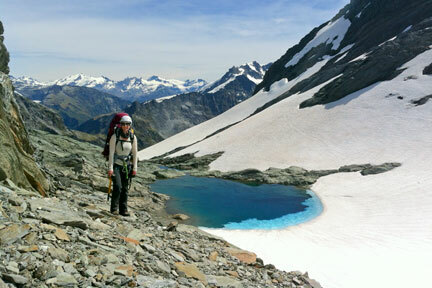 Alpine Recreation offer a wide range of both summer and winter treks and hikes to suit various levels of fitness, ability and experience - many of our clients return year after year for a new mountain challenge. We specialise in providing a personal service and creating custom alpine adventures - just ask us! "Ball Pass was by far the best hike myself and partner have done to date. You can expect to be physically and mentally challenged as it is no walk in the park and you must be focused on what you're doing at all times. The Caroline Hut is nice and cosy and you couldn't ask for a better place to kick your boots off each night and enjoy great company and good wholesome food. Our guide was fantastic and we knew we were in safe hands at all times with her depth of experience and her willingness to teach us some great new skills." 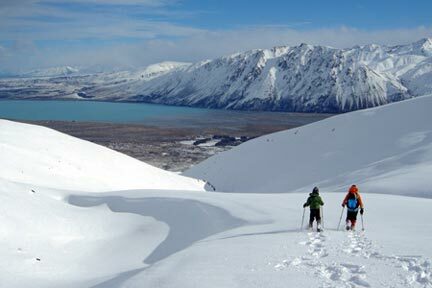 Remote highland trekking above Lake Tekapo. Great star-gazing opportunities. 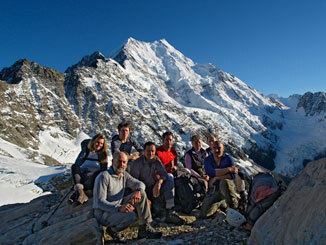 Hike up the Ball Ridge to Caroline Hut to take in the stunning views of Aoraki. 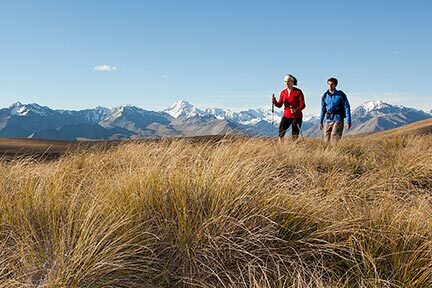 New Zealand's highest guided Trek! Trekking in the Ball Pass area and ascent of Kaitiaki Peak. Our most popular alpine trek. 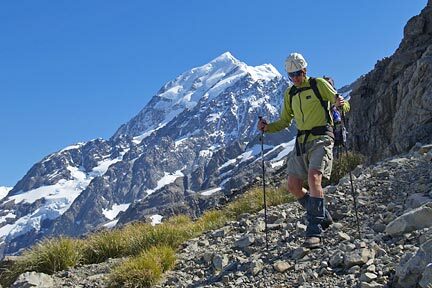 A challenging alpine crossing of the Mount Cook Range. 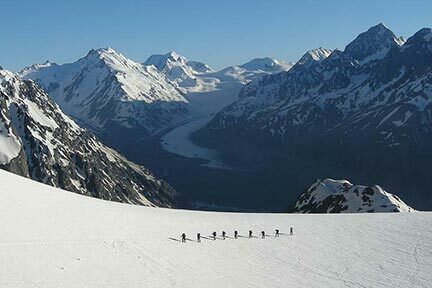 Glacier trekking and stunning mountain views on New Zealand's largest glacier. 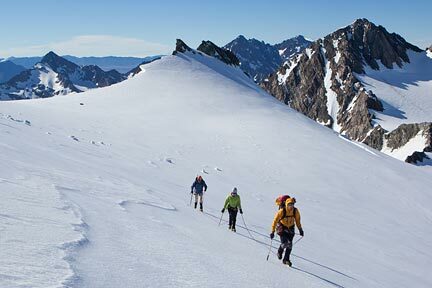 Combine glacier trekking and some introductory level mountaineering for a great alpine adventure. 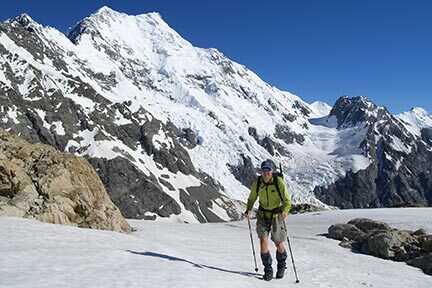 Glacier trekking and some easy ascents above the bush-line on Fox & Franz Josef Glaciers. A Southern Alps crossing from Mt. Cook Village to the West Coast. The classic Main Divide crossing. Great terrain for beginner to advanced snowshoers. 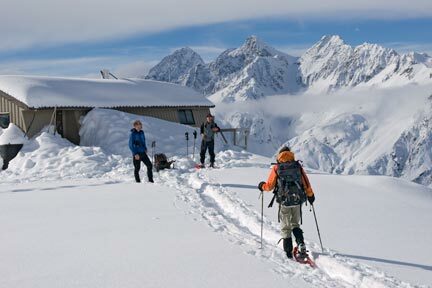 Expedition to Caroline Hut - an adventure for experienced snowshoers. Get your workmates together and experience and work through challenges as a team in the mountain environment. 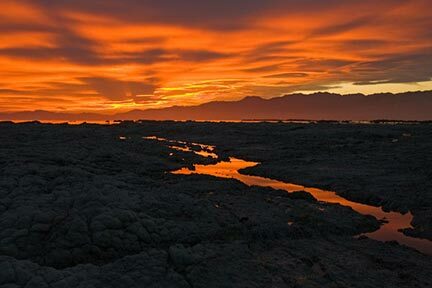 North & South Island Wilderness Walking adventures focussing on New Zealand's natural history, flora and fauna. 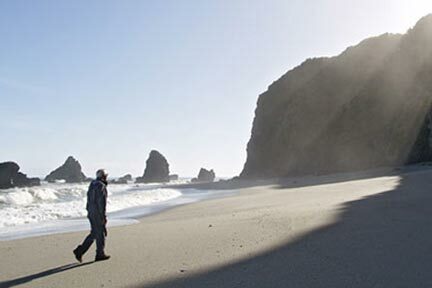 Trekking und Wandern auf den Nord- und Südinseln Neuseelands.